This is my favourite thing on the internet today. Me playing records at people is something I like to do. 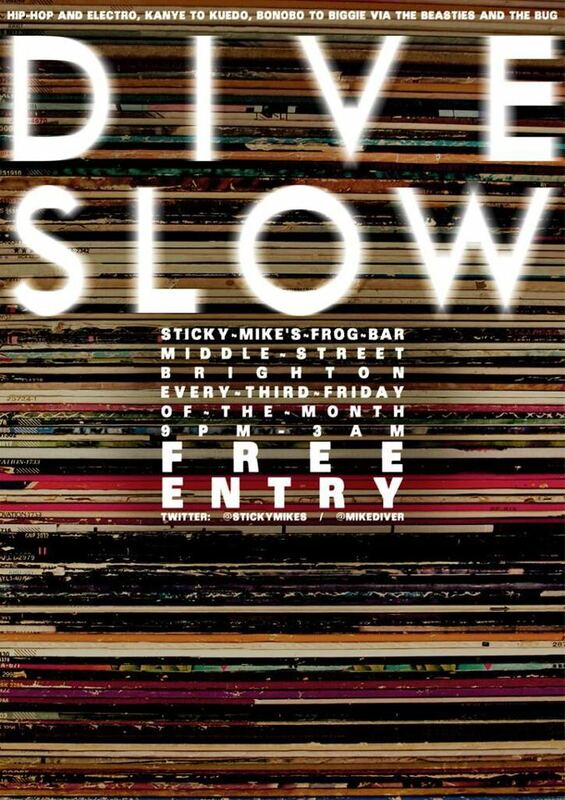 I do it once a month at Sticky Mike’s Frog Bar in Brighton. I call this night Dive Slow. Forthcoming dates for your diary: January 18, February 8 and March 15. Links take you to Facebook event pages. These nights are free, and run from around 9pm. For December’s night, the most splendid gentleman Ghostpoet played a terrifically high-tempo guest set, which had the (capacity, I should think, judging by the sweat) crowd bouncing like never before at a Dive Slow night. It was excellent times. In February Woodpecker Wooliams is calling in for a guest set. Will her selections be as max-BPM? You’ll have to come on down to find out. Book me to DJ your club/night/gig/festival. I come really cheap. On Twitter. Backed by ‘Mirrors’. Listen to both tracks on Soundcloud. Buy from iTunes/Amazon. Here ends this advertisement for something good. Paul Connolly’s article on Nirvana and them not being particularly good. You know, this one. Maybe you read it already. Needless to say, I don’t agree with it. But, then, everyone is entitled to their opinions. But as the lead (?) music journalist at the (hate)Mail, surely Connolly is better than this – better than an article written purely to provoke inevitable reactions from Cobain acolytes and the wider critical community alike. To reduce a band like Nirvana – an act splintered apart before their time, who I am sure had their greatest album still in them – to three songs of note is amazing. And that two of them aren’t exactly standouts in their catalogue for the ‘average’ fan – Frances Farmer… being an album cut from In Utero, and Oh, the Guilt their side of a split 7″ shared with The Jesus Lizard (yes, I have it; no, I won’t sell it to you) – is peculiar indeed: here’s a piece criticising Cobain for his attitude, praising pop hits over angst-riddled rock, yet the writer selects two seemingly arbitrary cuts rather than the far more ‘instant’ fare – All Apologies, Drain You, About a Girl, Lithium etc. I exchanged a couple of emails with Connolly after he wrote these kind words about me: “If you’re going to accuse me of hitting fresh lows have a good, hard look at yourself, young man and the one-eyed balderdash you’re coming out with.” Ultimately, we agree to disagree (and we like a lot of the same music, it should be noted). I don’t have a problem with writing to quite deliberately cause a kerfuffle, but it seems dramatically imbalanced in this instance – Nirvana wrote pop-rock that sparkled just as easily as they did dirges for the disaffected. Just seems a bit desperate, a cry for hits amongst so many articles on Nirvana and Nevermind – the album, of course, is 20 years old this month. Anyway, I’m just fuelling the fire here. So I’ll stop. But remember Nirvana for their great music – don’t (like you were) be swayed by one man’s remarkably reductive words. I can’t think of an album of my generation to have had the impact Nevermind did when I got a taped copy of it from a mate’s older sister when I was in the first year of senior school. Teenage dreams might well be so hard to beat – but those you have before hitting 13 can last so much longer.